Those who know me understand that I am not much of a consumer of grooming or ‘beauty’ products: no shampoo for me and similarly no conditioner either. As far as moisturiser goes, a touch of jojoba oil is my limit, or a slap of Nivea before flying. When I want to wash my hair, soap is all I use. From an economic perspective (apart from camera gear) I’m not much of a consumer. However, like most men who shave, I do need to use a razor every two or three days. I shave every morning when presenting. I wish I could grow a beard, but there are two areas on my face that just don’t grow hair—so seems no beard in this lifetime. 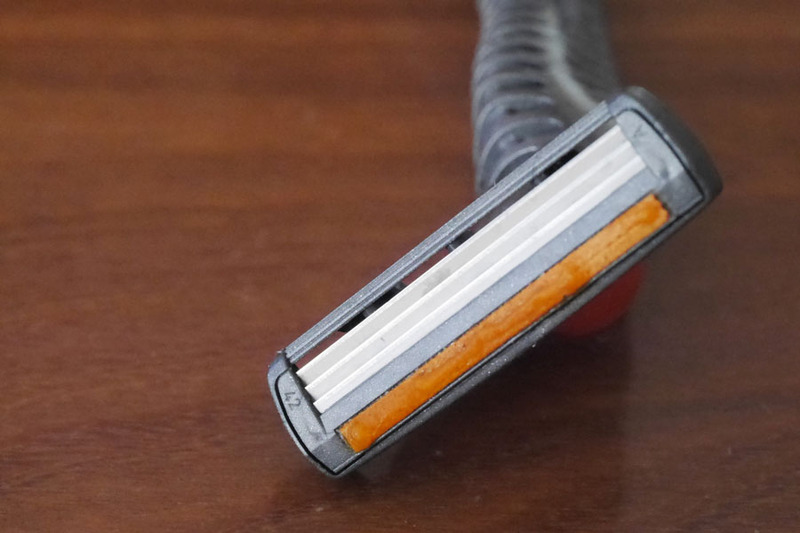 Since buying my very first razor I have always experienced a certain amount of resentment at the extraordinary cost of these utility devices, and I re-experience this tinge each time I have to buy one. I usually make a single blade last a few weeks, too; this is not so much frugality as the same resistance to buying. One would have thought that there must be a market niche for an extremely good razor that is inexpensive and freely available. Until recently this has not been the case. At one time there emerged a series of products from a company called “RazWars”; I had high hopes, but theirs is a subscription model, and that does not suit me AND (far and away the worst aspect) their initial razors were crap, frankly. 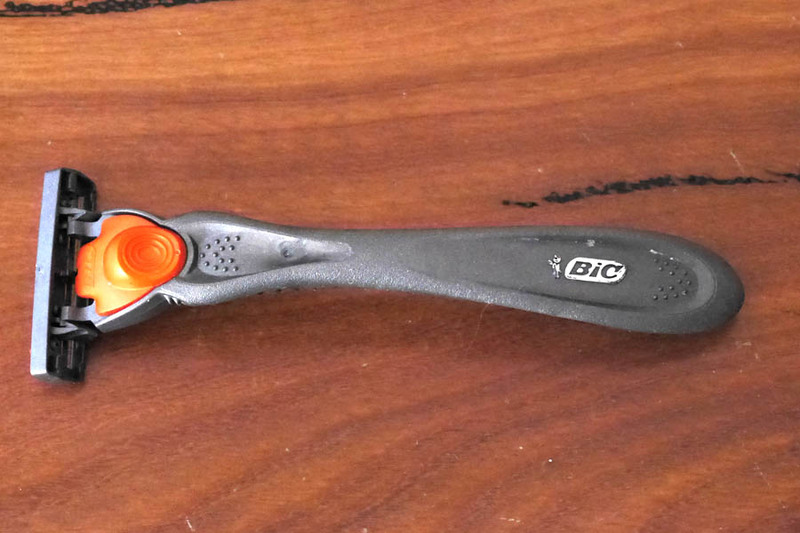 Today I present to you the BIC Hybrid “Advance” razor. I give this tool four point five stars—an unprecedented rating in my personal history. Not even Kubrick’s best film gets five stars from me! But this simple razor is a marvel of good ergonomics; extremely sharp blades that stay sharp for weeks of use; is 100% disposable (as in 100% recyclable); and is extremely good value for money. When I first tried this razor I was so impressed with it I went out and bought two more packets which contain the recyclable handle and six so-called ‘cartridges’ which are three blades and the ‘glide’ strip combined. The pack below costs $7.49 AUD—this is around a third of the price of any competing product. But the best part by far for me is that the whole razor is 100% recyclable: the handle is made of a relatively soft plastic and the blades are steel. I am not sure about the bubble pack—close inspection does not reveal any details about its recyclability. This is the reason for the half-point deduction, too. In this (for once) easy-to-open bubble pack, you will find the handle, and this actually stays reasonably grippy, even when soapy. I am a fairly old-fashioned guy in some ways and I use a shaving brush and whatever soap is in my shower (currently I am using some lemon myrtle soap given to me by Cherie). And a few quick swirls of the brush on the cake of soap and immediately you have perfect shaving foam: no waste, no hydrocarbons, a lovely smell and a chemistry that our body is perfectly adapted to. No downside. 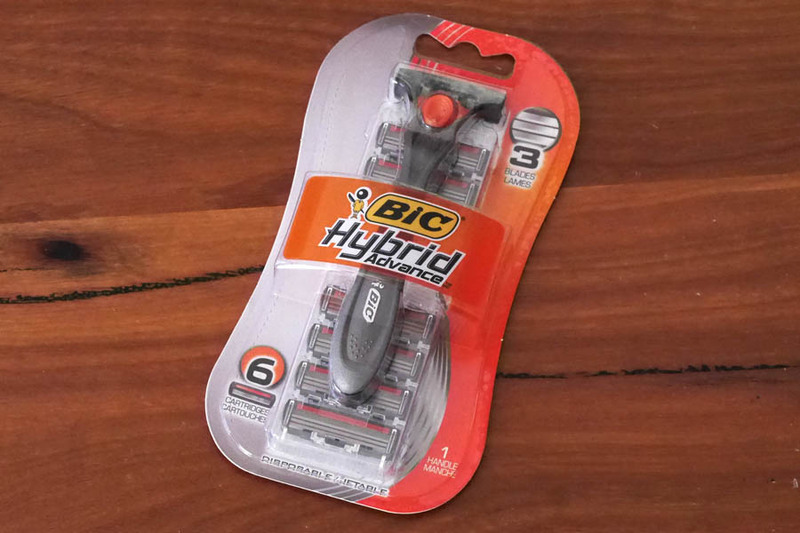 The glide strip slowly melts over time and it provides an additional lubricant to whatever you like shaving with. In my opinion glide strips are unnecessary but they’re also no hindrance, so okay. 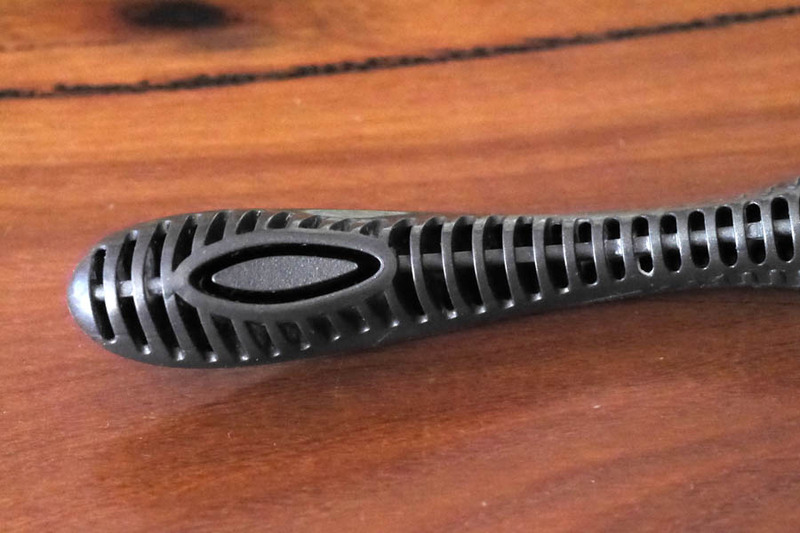 And here’s the top view of the handle showing you the button that you need to press in order to change cartridges; like the rest of the razor it works perfectly. I’m almost finding it hard to utter these words, but there is actually nothing about this design that I would change if I owned the company. I cannot recommend these razors highly enough, and I believe they will be just as suitable for women as for men. It is not my practice to promote anything here apart from camera gear that I use myself but I make an exception in this case. 4.5 stars from me for the BIC hybrid “Advance”. The last bit is over the top (it reminds me of advertisements for soap which promise “whiter than white”). Nonetheless, this is a great tool and I recommend it to you.